The machine base is a sturdy Cast Iron base, which forms the machine table and is suitably supported by a sturdy steel angle frame. ¼ h.p. 1440 rpm single-phase 220 Volts AC-50 cycle motor to drive the grinding wheel. A central housing that contains the main shaft driven by the main motor, the r.p.m. of which can be adjusted with the help of step pulleys provided. 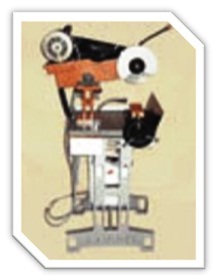 The main facetor of the machine is mounted on a bearing pedestal. 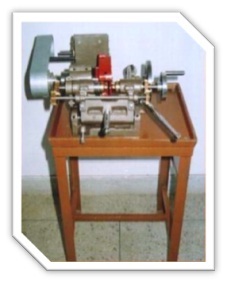 The master template is fixed close to the collet revolving handle and is supported by a revolving base. Separate templates are supplied for different shapes. The machine is fixed with the light attachment and a control panel, which contains the various electrical switches and a pilot lamp. The machine is fixed with coolant splash guards and coolant re-circulation system. The Gemstone is inserted and locked into the collet like cup which holds the stone firmly. The Girdle of the stone is then ground on the grinding wheel in accordance with the shape of the template used. The motor helps in rotating the grinding wheel. The forward and circular movements of the stone are to be carried out manually with the help of the handles provided for the purpose. 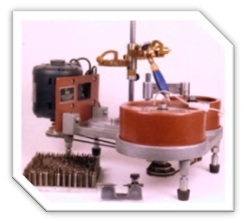 The machine is ideal for shaping and calibrating Girdles of virtually all gemstones in almost all conceivable shapes. Different master templates are required for different shapes. 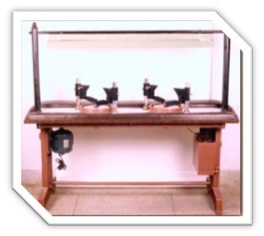 One single machine for shaping as well as calibrating the Girdles of virtually all Gemstones. Easy to handle and operate the machine. Hassel-free operations as the stones are not required to be dopped. More yield from the same quantity of rough stones as most of the weight loss is primarily due to incorrect dopping of the stones – and this problem is saved in this machine – resulting in higher yield. The grinding wheel is not provided with the machine.